Pharology is the study of lighthouses, so this site is dedicated to bringing you information about Lighthouses of the World. 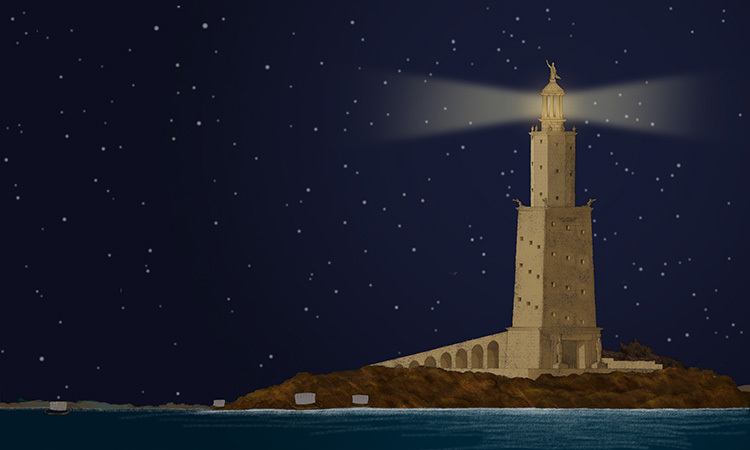 The first, and probably most famous lighthouse was the Pharos of Alexandria. Shown below, it was a fabulous lighthouse built around 280 BCE in Alexandria, Egypt. One of the great engineering structures of all time, it was one of the Seven Wonders of the Ancient World. The word 'pharology' is derived from pharos, the Greek word for lighthouse. Today, French people call a lighthouse un phare, Spanish people call it faro, and in Portuguese it is farol. In Romania and Bulgaria a lighthouse is called a far, whilst in Norway it is a fyr. However, like the English, Germans use a word that is more obviously descriptive, Leuchtürme, i.e. "light tower". The above illustration is an impression of the Pharos of Alexandria by Alfonso Biescas. It was commissioned for use in the new book entitled Ancient Lighthouses by Ken Trethewey, now available from your local Amazon website or from our publishers' website. 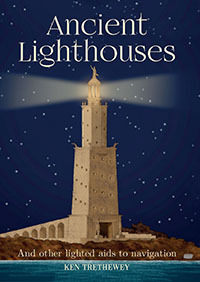 This is the only book of its kind to deal explicity with the matter of how lighthouses came into existence. Besides containing the most up-to-date description yet of the Pharos of Alexandria, it also contains a catalogue of ancient lighthouses. Lighthouses were developed around the world to improve navigation and to help save lives at sea. As such they have come to represent a positive force for humanity. In recent times, lighthouses have become part of a more general activity - the provision of Aids to Navigation. This task has been normally undertaken through the establishment of national bodies under government direction. These bodies became known as the General Lighthouse Authorities (GLAs). In 1957, an organisation was formed in France for the international oversight of the entire range of activities that included the provision of aids to navigation. This entity was called IALA - AISM (originally, the International Association of Lighthouse Authorities.) Today, most of the maritime countries of the world are members of IALA-AISM. W: What Is A Lighthouse?